The Sax Practice Harness™ offers an innovative solution for players who experience neck and shoulder fatigue during long practice sessions. The Sax Practice Harness™ offers an innovative solution for players who experience neck and shoulder fatigue during long practice sessions. 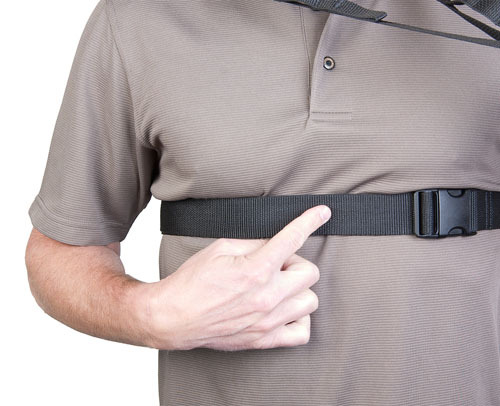 Its unique design features a torso strap that is worn at the base of the rib cage and fastens with a quick disconnect buckle. This gives the player full air flow and control while offering a very secure yet mobile system to encourage freedom of movement. The two shoulder supports are made of a comfortable memory foam padding over customizable aluminum supports that bend to conform to the shape of your shoulders. 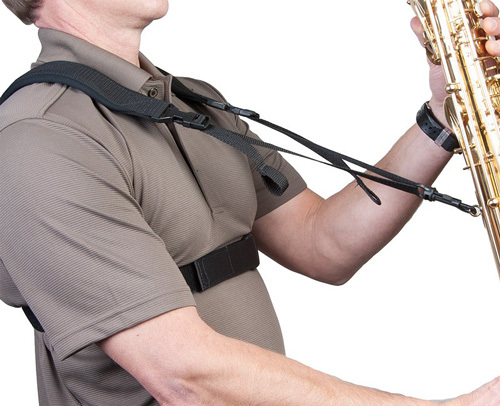 Because the fit of the Sax Practice Harness™ is dependent on the individual's body, it is really impossible to give it an accurate length adjustability range. The torso strap fits at the base of the ribcage, and the distance from there to the top of one's shoulders is going to vary widely. This variation will put the bend of the aluminum supports at a different place, affecting the overall length of the strap portion. Fastening the torso strap is quick and easy. A quick disconnect buckle maintains a constant size yet can be freely adjusted to customize the fit. 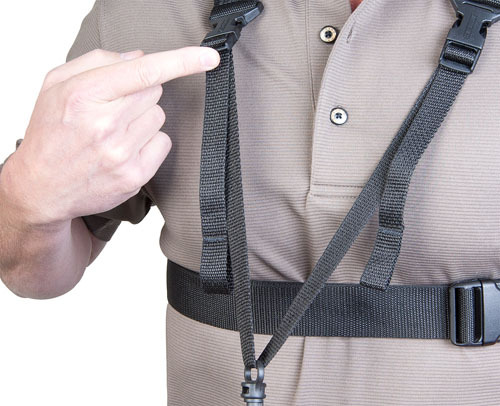 The length of the harness can be adjusted from either side with just a single pull and the swivel hook slides freely from side to side so you can position the instrument where it's most comfortable. If a different hook option is preferred, the Sax Practice Harness™ can be used with the wide range of Neo Hook Systems which are sold separately. 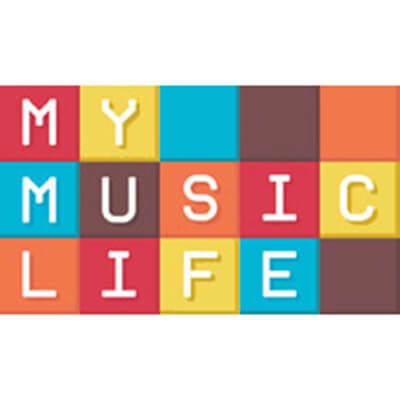 This gives you the ability to select the hook style that is just right for you. 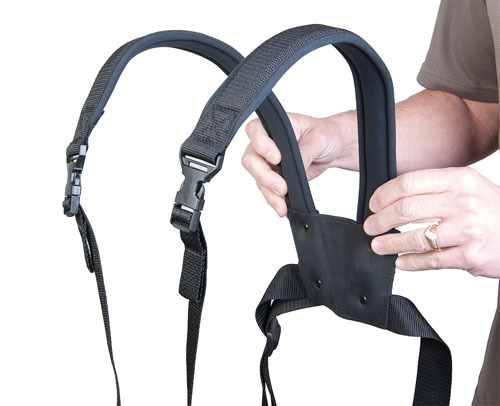 The Sax Practice Harness™ is proudly made in the USA and offers a great alternative to the traditional harness system. Try it today! 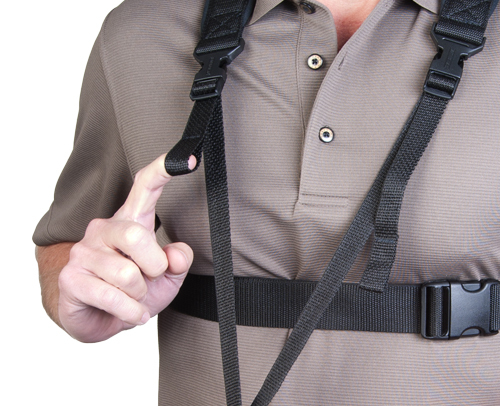 The Sax Practice Harness™ is proudly made in the USA and offers a great alternative to the traditional harness. 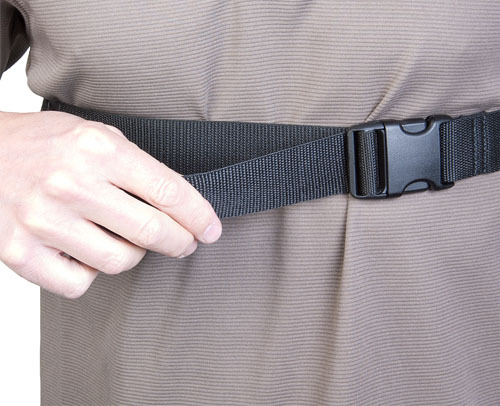 The torso strap measures 30"–60" (76,2cm–152,4cm). 1. Begin by bending the top half of the shoulder pads to the general shape of your shoulder. Many people find that bending the shoulder pad around their leg gives a good result. 2. Once you have the general shape, it can be fine tuned later with the help of a friend for any final adjustments. 3. 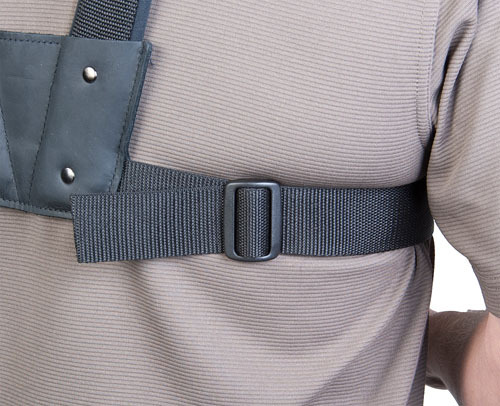 With the harness hanging from your shoulders, fasten the belt portion with the quick disconnect. 4. Position it so that it sits at the base of your sternum. 5. 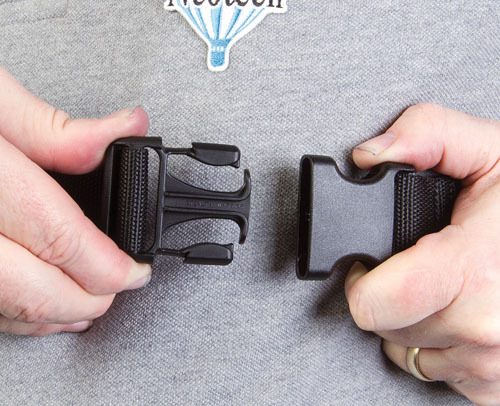 The length of the belt portion is fully adjustable by taking up the slack through the quick disconnect buckle and securing the end with the triglide. 6. If there is too much webbing left over, it can be carefully trimmed with sharp scissors and the end seared with a match or lighter to prevent fraying. You will want the belt to be snug, but not too restrictive for your breathing. 7. To adjust the length of the neck strap, simply grasp the webbing tab at the shoulder position quick disconnect and pull it downward. This adjustment can be made on both sides. This allows for an extremely wide range of possible adjustments. 8. 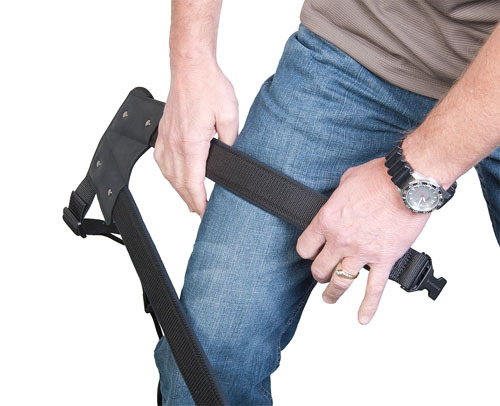 To lengthen the strap, simply lift the ladder-lock connector at the shoulder position and gently pull the hook downward again. 9. 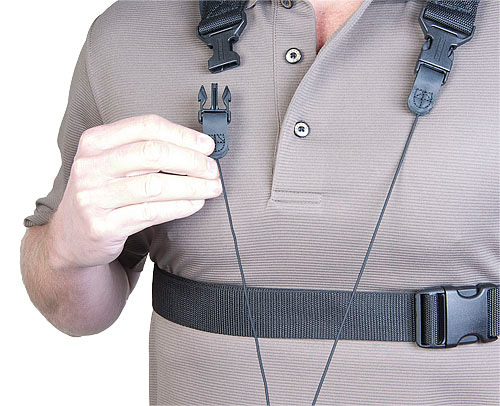 Unlike most other harnesses, Sax Practice Harness™ allows full upward and side-to-side movement. 10. 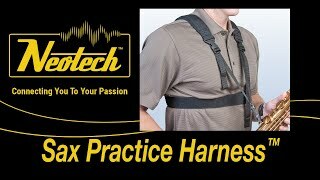 If a different style of hook is desired the Sax Practice Harness™ is fully compatible with Neotech's Neo-Hook™ system (sold separately). This is a great unit. I am a doubler. I also don't like the feeling and immobility of a hook position on normal harnesses. This unit feels like a good strap but the weight is not on your neck. You can move the horn around, change horns easily and get different types of hooks and strap lengths to use interchangeably with the same basic unit. I just ordered my second one even though the first is still perfect because I never want to be without it from alto to bass. Innovative solution for players who experience neck and shoulder fatigue during long play. High recommendation!